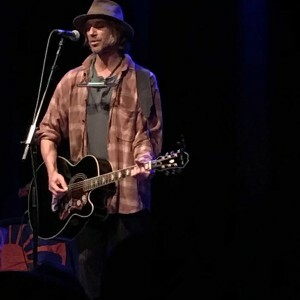 Todd Snider walks on stage in goofy hat, trusty guitar, barefoot but also with his equally raggedy dog, Cowboy Jim, who promptly lies down and listens to these songs and stories one more time. “It don’t get folkier than bringing your @#%ing dog!” Snider declares to the appreciative audience at the Birchmere Music Hall and starts in on one of his newest songs, a talking blues about television, reality, reality television and our current situation (“Reality killed by a reality star”). It was so up to date it even had a commentary about Michael Jackson (“Reality killed that video star”). Snider, 52, likes to take apart traditions even as he is extending them, so he took time to explain the rules of the talking blues format (“All you gotta rhyme is a line or two”) within the song. And the format seemed just right for him, as his shows are a mix of songs with sometimes equally-long stories. And if the songs are old favorites, some of the stories are too. They get their own titles on his live albums, and his audiences laugh anew at each one. Snider first came to fame, oddly, with an offhand rock commentary, “Talking Seattle Grunge Rock Blues,” about a band too cool to play a note. But that song’s been left off his list and from the requests. While Snider likes to put on the persona of the stoned slacker, he puts together some pretty good albums, the latest of which had come out days earlier, “Cash Cabin Sessions, Vol. 3” although there aren’t any parts one or two, just as there isn’t a part one of his “Better Than Ever Blues, Part 2.” It’s another example of his poking fun as an aspect of song tradition. The new album seems titled like a game show, but it was actually recorded in Johnny Cash’s Cash Cabin Studio outside of Nashville and included a lot of his deconstruction of music idoms even as he extended its traditions. “Banjo” is the odd song that has a call-back joke from its spoken intro, about how Townes Van Zandt once said there’s only two kinds of music, the blues or “Zip-a-Dee-Doo-Dah,” and he also had a call-back joke late in the show that referred to an earlier story about being ready to split any situation within 15 minutes. It’s the kind of thing tying together a comedy set that Dave Chappelle does so well, proving Snider has the simultaneous skills of comedy and Woody Guthrie-style musical entertaining. And Cowboy Jim just follows him wherever he goes.